The Celestron 44208 is an all-metal bodied, low-power stereo microscope with advanced features such as high-quality glass optics, 1x and 3x objectives, 10x and 20x eyepieces and upper and lower illuminators. With magnification ranging from 10x to 60x, you’ll be sure catch every detail on 3D objects such as coins, minerals, insects, leaves and documents. Additionally, you’ll enjoy exciting discoveries right out of the box with four included insect specimens. Perfect for the serious student and discriminating hobbyist, the S10-60 Stereo Microscope is well suited for up-close viewing that will last for years. The Celestron 44208 has many exciting features for users of all types. 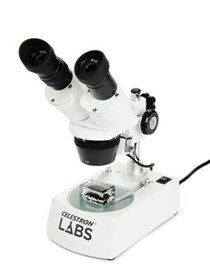 You can extend the lifetime of your Celestron 44208 with the purchase of a FactoryOutletStore Factory Protection Plan. See the Celestron 44208 gallery images above for more product views. The Celestron 44208 is sold as a Brand New Unopened Item.